DEET is the active ingredient in many bug repellents, and this very popular chemical has been shown to be extremely effective against both ticks and mosquitoes. 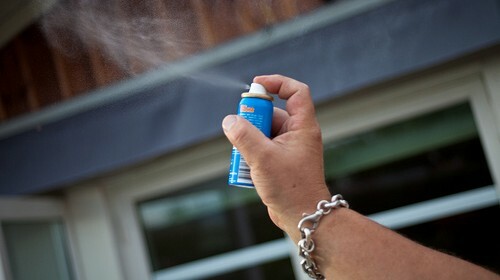 How do you use DEET safely, and what are the potential risks? Mosquitoes and ticks are active again! Many people struggle to find bug repellents that really work. DEET has been shown to be extremely effective. To many people, mosquito bites are nothing but a minor annoyance. These people find that mosquitoes don't really target them that much, and when they do get bites, they are small enough to ignore altogether. Folks who fall into this category might buy citronella candles and other repellents when they happen to remember, or they may get by without ever buying a mosquito repellent. Mosquito bites provoke a much more intense reaction in some others. Only female mosquitoes actually feed on blood. They choose a person using a combination of factors, including pheromones and the amount of carbon dioxide the person is exhaling. The red bump and itching that results afterwards isn't actually caused by the mosquito's bite itself, but by the immune system's reaction to the mosquito's saliva. Over time, the immune system becomes sensitized to mosquito saliva and develops a more effective reaction. This means that little kids often have more severe symptoms than adults do. Humans of all ages who are especially sensitive to mosquito bites may develop large bumps and thus larger areas that itch. The skin can become extremely red and inflamed, and in severe cases the victim can even develop urticaria (hives), a lymph-system inflammation or anaphylactic shock! Ticks pose a danger to everyone. The tiny arachnids are present on all continents except Antarctica, and are potential carriers of Lyme Disease everywhere though some areas are considered to be more high-risk than others. You may not notice a tick crawl up your leg, or your child's, and because these blood-sucking creates are so small and like to latch on in warm areas of the body, like skin creases, you may never notice that you or your children served as a meal for a tick. Yet, ticks can permanently alter the life of their victims if they were carriers of Lyme Disease. The characteristic bull's eye rash is the most obvious early symptom of the disease. Noticing it enables you to seek treatment early on, but not everybody who develops Lyme Disease is that lucky. Later symptoms include flu-like symptoms, loss of muscle tone, meningitis (in turn, this can manifest as headaches), encephalitis, loss of cognitive function, arthritis and in rare cases even death. You can put strategies in place that will minimize your risk of Lyme Disease, by maximizing your chance of catching ticks before they latch on (and those who are interested can check my article about Lyme Disease in the links box below). The bottom line is, however, that anyone who spends any time in natural environments such as parks, forests, and gardens could be bitten by a tick and develop Lyme Disease. Isn't it best to repel ticks by using an effective bug repellent? What Causes Itchy, Swollen Fingers?